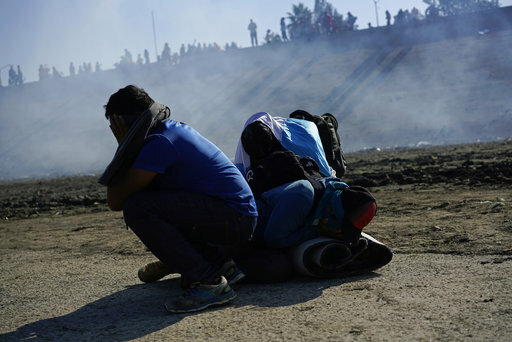 By Miriam Valverde on Monday, November 26th, 2018 at 5:13 p.m.
U.S. Border Patrol agents fired tear gas at migrants seeking entry at the southwest border, claiming the migrants were throwing rocks and bottles. "Is this legal? Is this moral? Is this accurate? What is happening here?" tweeted Sen. Brian Schatz, D-Hawaii, on Nov. 25. Schatz also reportedly sent but eventually deleted a tweet asking if tear gas was "consistent with the Conventions on Chemical Weapons"? Schatz later on Nov. 25 tweeted that he "deleted the one about chemical weapons because I just don’t know enough about what happened. Does this not strike you as excessive?" Many users on social media debated whether tear gas is a chemical weapon, and if it is, why was it used against migrants? Tear gas is allowed to be used in domestic law enforcement to control riots. But it’s considered a chemical weapon if used as a method of warfare. It’s banned on the battlefield. Thousands of Central American migrants are on the Mexican side of the U.S.-Mexico border hoping to get into the United States. Many are fleeing gang violence and seeking asylum in the United States. They are part of caravans of migrants that started trekking from Honduras weeks ago. The group includes men, women and children. The migrants are reportedly camping at a Tijuana stadium, near the Tijuana-San Diego border area. News reports say that hundreds of them left the stadium on Nov. 25 and marched over to the border, some carrying posters and signs, to make their case and be allowed into the United States. The New York Times reported that at some point, the march "veered out of control," and "hundreds of people tried to evade a Mexican police blockade and run toward a giant border crossing that leads into San Diego." Video shows some migrants throwing rocks over a fence. Carla L. Provost, chief of the U.S. Border Patrol, told Fox News on Nov. 26 that agents used tear gas to defend themselves. "Our agents were being assaulted," Provost said. "A large group rushed the area, and they were throwing rocks and bottles at my men and women, putting them in harm's way as well as other members of the caravan." The response was necessary to "disperse them from the area," she said. Rodney S. Scott, chief patrol agent for the San Diego sector, also told CNN that U.S. officials arrested 42 people, mostly adult males, who made it into the United States. Scott said agents "deployed tear gas to protect themselves and to protect the border" after migrants threw rocks and debris at agents. At least three agents were struck by rocks, but were protected by their tactical gear: helmets, shields, and bulletproof vests. Some border patrol vehicles were damaged, he said. Tyler Q. Houlton, a spokesman for U.S. Department of Homeland Security, which oversees U.S. Customs and Border Protection, on Nov. 26 tweeted that CBP "has always maintained the right to responsibly protect themselves from those wishing to cause them harm while they do their important and dangerous jobs." He tweeted as an example a 2013 article from the San Diego Union-Tribune saying border patrol agents used pepper spray against a group of about 100 migrants who threw rocks and bottles at agents. "Border Patrol agents have fired gas on the southwest border before and there doesn’t appear to be any law against it, but the more important question is whether such an action was necessary to maintain order and protect lives," said Alex Nowrasteh, an immigration policy analyst at the libertarian Cato Institute. "We’ll have a better picture of that in the near future." Tear gas, a type of a riot control agent, is considered a chemical weapon if used as a method of warfare, according to the Organization for the Prohibition of Chemical Weapons, the implementing body for the Chemical Weapons Convention. The United States is one of 193 parties committed to the convention. Member states are allowed to possess riot control agents and use them for domestic law enforcement purposes, the organization said. "Riot control agents are intended to temporarily incapacitate a person by causing irritation to the eyes, mouth, throat, lungs, and skin," the group said on its website. As we noted in a 2014 fact-check related to law enforcement use of tear gas in protests in Ferguson, Mo., riot control agents were "the topic of long and heated debates" during negotiations of the convention. In the end, a compromise was reached to allow the use of tear gas for riot control but prohibiting it for warfare. A political scientist then told us that part of the reason why tear gas is banned on the battlefield is because soldiers in the field don't have the ability to readily distinguish if a gas being used is tear gas or something more lethal. Experts also said that there were few immediate alternatives to tear gas for riot control and noted a lack of desire to change the status quo. Says of tear gas use against migrants, "Is this legal? Is this moral? Is this accurate? What is happening here?"